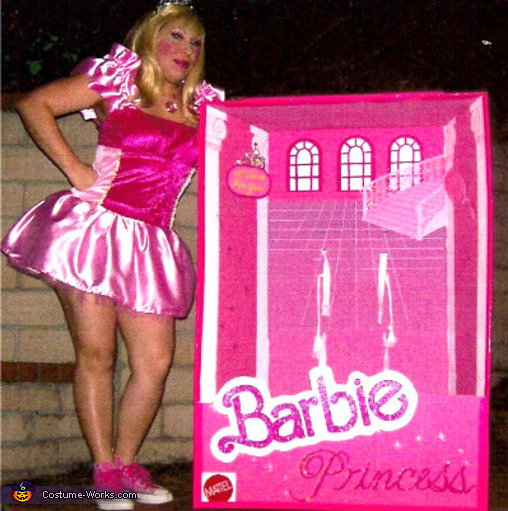 This is Lisa, as Barbie, in her very impressive Box. Barbies Box contains Accessories... "Tiara for you" and Signature Hairbrush. Lisa started with a Wardrobe Box she purchased. This was bare Cardboard. All Artwork was done by Lisa. Lisa made the Barbie Dress she is wearing. Then she donned a Blonde Wig and Blue Contact Lenses. She wore Toy Jewelry to wrap up her look. Lisa says it took about a month to complete this project... But we can agree... It WAS well worth the time.